More than 1,000 years ago, a goatherd in Ethiopiaâ€™s south-western highlands plucked a few red berries from some young green trees growing there in the forest and tasted them. He liked the flavour â€“ and the feel-good effect that followed. Today those self-same berries, dried, roasted and ground, have become the worldâ€™s second most popular non-alcoholic beverage after tea. And, as David Beatty discovers in words and pictures, the Ethiopian province where they first blossomed â€“ Kaffa â€“ gave its name to coffee. The story of coffee has its beginnings in Ethiopia, the original home of the coffee plant, coffee arabica, which still grows wild in the forest of the highlands. While nobody is sure exactly how coffee was originally discovered as a beverage, it is believed that its cultivation and use began as early as the 9th century. Some authorities claim that it was cultivated in the Yemen earlier, around AD 575. The only thing that seems certain is that it originated in Ethiopia, from where it traveled to the Yemen about 600 years ago, and from Arabia it began its journey around the world. Among the many legends that have developed concerning the origin of coffee, one of the most popular account is that of Kaldi, an Abyssinian goatherd, who lived around AD 850. One day he observed his goats behaving in abnormally exuberant manner, skipping, rearing on their hindlegs and bleating loudly. He noticed they were eating the bright red berries that grew on the green bushes nearby. Kaldi presented the chief Monk with a handful of berries and related his discovery of their miraculous effect. â€˜ Devilâ€™s work! â€™ exclaimed the monk, and hurled the berries in the fire. 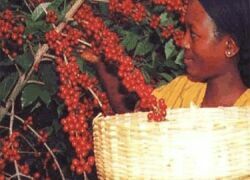 Another account suggests that coffee was brought to Arabia from Ethiopia, by Sudanese slaves who chewed the berries en route to help them survive the journey. There is some evidence that coffee was ground and mixed with butter, and consumed like chocolate for sustenance, a method reportedly used by the Galla tribe of Ethiopia, which lends some credence to the story of the Sudanese slaves. The practice of mixing ground coffee beans with ghee (clarified butter) persists to this day in some parts of Kaffa and Sidamo, two of the principle coffee producing regions of Ethiopia,. And in Kaffa, from which its name derives, the drink is brewed today with the addition of melted ghee which gives it a distinctive, buttery flavour. From the beginning, coffeeâ€™s invigorating powers have understandably linked it with religion, and each tradition claims its own story of origins. Islamic legend ascribes the discovery of coffee to devout Sheikh Omar, who found the coffee growing wild while living as a recluse in Mocha, one famous coffee producing place in Yemen. There are numerous versions of this story concerning the Sheikh Omar, which relate how he cured the King of Mochaâ€™s daughter with coffee, and another where wondrous bird leads him to a tree full of coffee berries. Arabic scientific documents dating from around AD 900 refer to a beverage drunk in Ethiopia, Known as â€˜bunaâ€™, and the similarities in the words suggests that this could be one of the earliest references to Ethiopian, coffee in its brewed form. It is recorded that in 1454 the Mufti of Aden visited Ethiopia, and saw his own countrymen drinking coffee there. He was reportedly impressed with the drink which cured him of some affliction, and his approval made it soon popular among the dervishes of the Yemen who used it in religious ceremonies, and introduced it to Mecca. It was in Mecca that the first coffee houses are said to have been established. Known as Kaveh Kanes, they were originally religious meeting places, but soon became social meeting places for gossip, singing and story-telling. With the spread of coffee as a popular beverage it soon became a subject for heated debate among devout Muslims. The Arabic word for coffee, kahwah, is also one of several words for wine. In the process of stripping the cherry husk, the pulp of the bean was fermented to make a potent liquor. The Quran forbade the use of wine or intoxicating beverages, but those Muslims in favour of coffee argued that it was not an intoxicant but a stimulant. The dispute over coffee came to a head in 1511 in Mecca. The picture of Arabic coffee houses as dens of iniquity and frivolity was exaggerated by religious zealots. In reality the Middle Eastern was the forerunner of the European CafÃ© society and the coffee houses of London which became famous London clubs. They were enlightened meeting places for intellectuals, where news and gossip exchanged and clients regularly entertained by traditional story-tellers. The first coffee house opened in Venice in 1683. The famous CafÃ© Florian in the Piazza San Marco, established in 1720, is the oldest surviving coffee house in Europe. Throughout the 17th and 18th centuries coffee houses proliferated in Europe. Nothing quite like the like the coffee houses, or cafÃ©, had ever existed before, the novelty of a place to enjoy a relatively inexpensive and stimulating beverage in convivial company established a social habit that has endured for over 400 years. The first coffee house in England was opened in Oxford, not London, by a man called Jacob in 1650. A coffee club established near all Soulsâ€™College eventually becoming the Royal Society. Londonâ€™s first coffee house was in St. Michaelâ€™s Alley and opened in 1652. And the most famous name in the world of insurance, Lloyds of London, began life as a coffee house in Tower Street, founded by Edward Lloyd in 1688 who used to prepare lists of ships that his clients had insured. With the rapid growth in popularity of coffee houses, by the 17th century the European powers were competing with each other to establish coffee plantations in their respective colonies. In 1616 the Dutch gained a head start by taking a coffee plant from Mocha to the Netherlands, and they began large scale cultivation in Sri Lanka in1658. In 1699 cuttings were successfully transplanted from Malabar to Java. Samples of Java coffee plants were sent to Amsterdam in 1706, were seedlings were grown in botanical gardens and distributed to horticulturists throughout Europe. A few years later, in 1718, the Dutch transplanted the coffee to Surinam and soon after the plant became widely established in South America, which was to become the coffee center of the world. In 1878 the story of coffeeâ€™s journey around the world came full circle when the British laid foundations of Kenyaâ€™s coffee industry by introducing plants to British East Africa right next to neighboring Ethiopia, where coffee had first been discovered a 1,000 years before. Today Ethiopia, is Africaâ€™s major exporter of Arabica beans, the quality coffee of the world, and the variety that originated in Ethiopia, is still the only variety grown there. Coffea Arabica, which was identified by the botanist Linnaeus in 1753, is one of the two major species used in most production, and presently accounts around 70 per cent of the worldâ€™s coffee. The other major species is Coffea Canefora, or Robusta, whose production is increasing now due to better yields from robusta trees and their hardiness against decease. Robusta coffee is mostly used in blend, but Arabica is the only coffee to be drunk on its own unblended, and this is the type grown and drunk in Ethiopia, The arabica and robusta trees both produce crops within 3-4 years after planting, and remain productive for 20-30 years. Arabica trees flourish ideally in a seasonal climate with a temperature range of 59-75o F, whereas Robusta prefers an equatorial climate. In Ethiopiaâ€™s province of Kaffa a large proportion of the arabica trees grow wild amidst the rolling hills and forests of the fertile and beautiful region. At the Haro Farmerâ€™s Co-operative near Jimma the husk of the cherry is removed mechanically and the bean then fermented in water for 48 hours to remove the sugar. The beans are the dried on racks in the sun for about a week before being bagged up and sold at an auction. A smallholder, who may have anything from a half to two hectares, sells his beans to the Co-op which processes them and sells them at auction, returning a share of the profits to the farmer. Some 12 million people are dependent on Ethiopiaâ€™s coffee industry, managed by the Ethiopian Coffee Export Enterprise â€“ ECEE â€“ formerly the Ethiopian Coffee Marketing Corporation. An independent, profit-making organization, ECEE trades on the open market and controls about 50 per cent of the market following liberalization. ECEE processes its coffee at five plants in Addis-Ababa â€“ with a total capacity of almost 500 tons a day â€“ and a plant in Dire Dawa. The organization is also building a new 250-ton a day processing plant for washed coffee. ECEEâ€™s key markets are Germany, Japan, USA, France and the Middle East â€“ and is focusing on the US specialty market and Scandinavia. ECEEâ€™s major emphasis is on quality products such as premium blends, organic coffee and original unblended coffees from one specific plantation or farm. Within Ethiopia, there are some distinctive varieties that are highly sought after. The highest grown coffee comes from Harar, where the Longberry variety is the most popular, having a wine-like flavour and tasting slightly acidic. 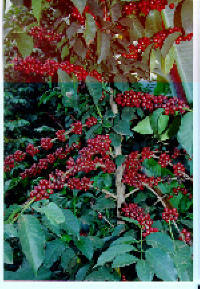 Coffee from Sidamo in the south has an unusual flavour and is very popular, especially the beans known as Yirgacheffes. 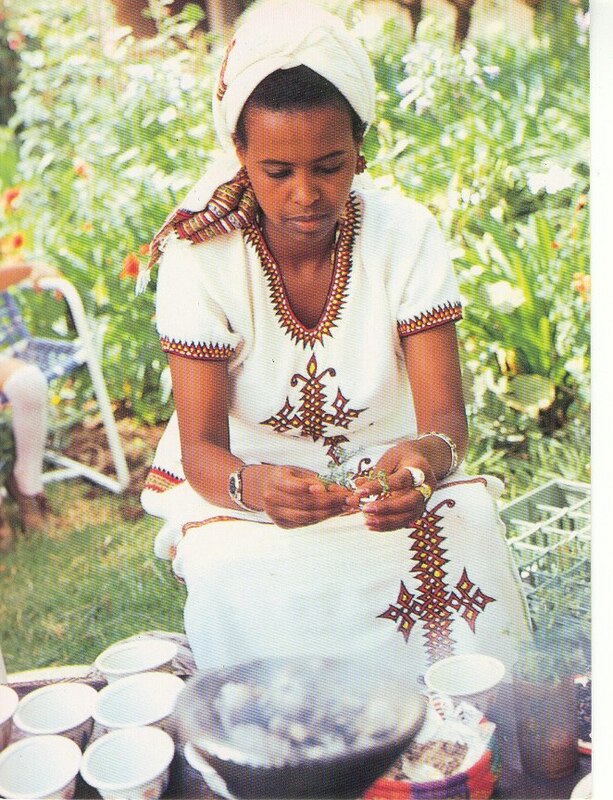 In many ways Ethiopian coffee is unique, having neither excessive pungency nor the acidity of the Kenyan brands. It is closest in character to the Mocha coffee of the Yemen, with which it supposedly shares a common origin, and it cannot be high roasted or its character is destroyed. The best Ethiopian coffee may be compared with the finest coffee in the world, and premium washed arabica beans fetch high prices on the world market. No visit to Ethiopia, is complete without participating in the elaborate coffee ceremony that is Ethiopia's traditional form of hospitality. Invariably conducted by a beautiful young girl in traditional Ethiopian costume, the ceremonial apparatus is arranged upon a bed of long grasses. The green beans are roasted in a pan over a charcoal brazier, the rich aroma of coffee mingling with the heady smell of incense that is always burned during the ceremony. The beans are then pounded with a pestle and mortar, and the ground coffee then brewed in a black pot with a narrow spout.